Home Costs > How Much Does Chimney Repair Cost? When it comes to a chimney repair, it can range anywhere from a simple sweep to keep it clean to as extreme as rebuilding it to make it look like, and act like, new again. Since a chimney won’t last forever, the cost of a chimney repair will greatly depend on the type of repair being done, the contractor performing the job, the complexity of your situation and the geographical location. 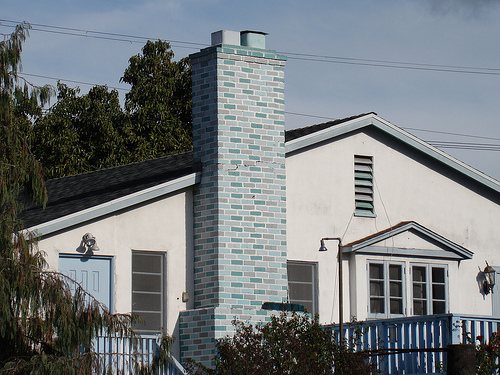 A chimney can be repaired for a myriad of reasons, each with its own corresponding cost. To help you figure out what may be wrong, we created a table, explaining the types of repairs you may encounter and what it may cost. Brick Replacement Replacing a section of brick or an entire side can get costly, especially if you want a close-to-exact match. In the case of a chimney, the cap's bricks can deteriorate as time goes on. For a smaller area of brick, often 12 to 24 bricks, the costs can cost about $350 for the labor only. Chimney Foundation A chimney that leans away from the house is often a sign of a poor foundation and will require piers to stablize the chimney. A typical job, which usually involves installing two helical or resistant piers, can cost $2,500 to $4,000. Chimney Sweep A chimney sweep is necessary to reduce the risk of a potential fire due to the creosote, the residue left behind as you burn wood, builds up. Cracks The masonry joints on your chimney, over time, will expand and contract as the seasons fluctuate. This, unfortunately, can lead to cracks forming, allowing smoke, embers and even carbon monoxide to escape outside of the walls. In most scenarios, the cracks will form in the corners but can cause structural damage if left ignored. The cost of repairing cracks will greatly depend on the size of the cracks. From as little as $150 for a simple brick mortar repair to $1,500+ if the chimney needs to be rebuilt. Leaks Related to the cracks, water can often find its way through the cracks, causing damage in the form of either wood rot or mold. These cracks are usually found along the roofline when the sealers fail. The water, when it's able to enter, can destroy the existing mortar and damage the wood near the fireplace. Most leaks can be fixed for $150 to $400. Replacing the Chimney Thankfully, most modern chimneys don't need to be torn down and rebuilt from scratch due to the inner sleeve or flue liner. In most cases, the outer course of the chimney only needs to be replaced, down to the roofline, which can save you a lot of money when compared to tearing the chimney down and starting from the start. $500 to $1,200 to replace the entire outside to more than $12,000 if the entire chimney needs to be redone. As you can see, there are a variety of repairs you may encounter when it’s time to fix your chimney. Since all repairs can be so unique, consider getting multiple quotes from licensed contractors in your area for free at HomeAdvisor.com. Here, you can simply explain your repair and contractors will contact you with an estimate. If your wood is burning slower than it used to, grab a flashlight and shine it up the chimney through the fireplace. Taking your fingers, scratch the build-up of the wall and examine the thickness of the soot. If it’s more than an eighth of an inch, then you may need to call in a professional. If you’re almost certain you need a chimney sweep, consider a few DIY methods before spending a few hundred dollars. Fireplace cleaning logs, for example, can cost less than $20 and can work by releasing a chemical into your chimney to loosen up any creosote along the walls. Another method to keep your chimney clean and safer is by burning citrus or potato peels, according to HomeAdvisor.com. The peels can prevent the creosote build up, whereas the potato peels are said to react to the creosote, keeping it from bursting into flames; however, don’t take this method as an alternative to a professional sweep.